In his work Dalton used relatively simple equipment and has been accused of being "a very coarse experimenter." However, he had a gift for reasoning and for drawing correct conclusions from imperfect experiments. He himself attributed his success primarily to simple persistence. Dalton's lifelong interest in meteorology did much to make that study a science. He began keeping records of the local weather conditions--atmospheric pressure, temperature, wind, and humidity--in 1787 and maintained them for 57 years until his death. During this time he recorded more than 200,000 values, using equipment which for the most part was made by him. Dalton's interest in the weather gave him a special interest in mixtures of gases, and his earliest studies were concerned with atmospheric physics. 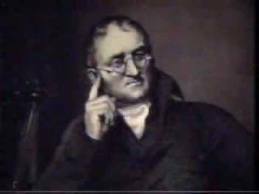 The formulation of his law of partial pressures (Dalton's law) was announced in 1803. It defined the pressure of a mixture of gases as the sum of the pressures exerted by each component solely occupying the same space. In 1800 he studied the heating and cooling of gases resulting from compression and expansion, and in 1801 he formulated a law of the thermal expansion of gases. His work on water vapor concentration in the atmosphere, using a homemade dew-point hygrometer, and his 1804 study of the effect of temperature on the pressure of a vapor brought him international fame. The formulation of the atomic theory, Dalton's greatest achievement, was developed gradually, almost inadvertently, through a series of observations resulting from his preoccupation with gases. It began with an attempt to explain why the constituents of a gaseous mixture remain homogeneously mixed instead of forming layers according to their density. The theory was first alluded to in a paper presented before the Manchester Literary and Philosophical Society in 1803 on the absorption of gases by water and other liquids. In the last section of the paper was the first table of atomic weights. The acceptance of his theory prompted Dalton to expand it further, and finally he published it in his New System of Chemical Philosophy (1808). Although William Higgins claimed priority over Dalton, the consensus is that Dalton conceived the idea that the atoms of different elements are distinguished by differences in their weight. As contrasted to others who may have vaguely glimpsed the principle, Dalton presented it as a universal and consistent fact and applied it to the explanation of chemical phenomena. Other, less significant contributions were his pioneering investigation of thermal conductivity in liquids and his 1794 paper in which he discussed color blindness. Dalton lived a simple life, kept to the doctrines of his Quaker faith, and never married. During most of his life he had little money and was almost excessively economical; however, by tutoring and doing routine chemical work at low pay his few wants were met. He had no flair for lecturing: his voice was rather harsh, and he was inclined to be rather stiff and awkward in manner. He is said to have had no grace in conversation or in writing. Despite his lack of these social assets, he apparently lived a quite happy life and had many friends. In 1810 Dalton refused an invitation to join the Royal Society but was finally elected in 1822 without his knowledge. As his fame grew, he received many honors, including a doctor's degree from Oxford in 1832, at which time he was presented to King William IV. For this occasion he had to wear the famous scarlet regalia of Oxford, which fortunately looked gray to his color-blind eyes and therefore was acceptable to him as an orthodox Quaker.